It is fitting to talk about our national symbols at the Anniversary of the Republic of Estonia on February 24th: limestone boulders, sturdy junipers, barn swallows … and cornflowers. Cornflower blue has enchanted me for years. Maybe because I remember from my childhood preparing herbarium pages together with my grandmother. Preserving the cornflower blue was the most difficult part in drying plants. But Grandmother’s work bore fruit and the blue has survived until today. Until today I have not connected the actions at the end of the 1960ies with the choice of the cornflower as our national flower. Yes, from 1969 the cornflower is the national flower of Estonia. It was chosen as the national flower based on a public opinion poll by the Estonian Nature Conservation Society. At the official national level the cornflower together with the barn swallow were confirmed as national symbols only in 1988. At that time local historians and nationally minded people both belonged to the Estonian Nature Conservation Society. The choice of the cornflower was most likely helped by its colour being in the national flag. And to consider further - after that it was easy to demonstrate one’s national attitude in the upsets of those times released by the socialistic system then, by adding the third national colour to a festive black and white outfit by having the cornflower blue in the buttonhole. I remember the discussions from the days of the restoration of independence, about whether the colour of our flag was sky blue or cornflower blue. But the reason for the discussions was a simple fact. All flags that were brought out to fly were sky blue, they were found in their hiding places in attics or secret chests – their blue had faded with time into a pale blue. The first blue-black-white of my life I did dot see as a flag but as Estonian Student Society (EÜS) bands in a wooden chest found after my grandmother’s death in her flat in 1974,. They were bands presented to her sister’s husband, Colonel Jüri Hellat, by his confraters and on them were also the names of the givers-confraters. Even those bands were not cornflower blue but sky blue. 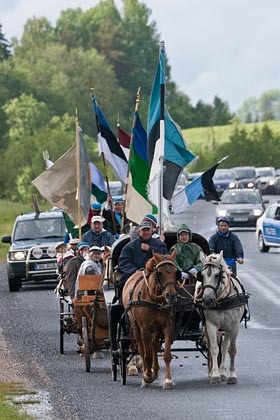 The first real blue-black-white flag that I saw flying was in my school days when Aivar Rikas on February 24th in 1981 put his stepfather’s blue-black-white flag into the flag holder of the Kilingi-Nõmme school. It cannot be said that it did not bring about trouble but even today I still remember the bright day with the blue-black-white flying from the slightly short flagpole – and maybe it was the bright sunshine of the day that made the blue of the flag lighter in my memory. The third occasion that I remember in connection with the blue of the flag is when we had already regained independence, the occasion when Arne Ader’s grandmother brought out from the back corner of a cabinet a headscarf with a blue-black-white flag design and tied it around her hair. The almost 80 year old grandmother’s back suddenly straightened in doing so. But the blue of this scarf too had faded into a pale light blue. From then onwards however the blue-black-white is cornflower blue in my mind. The flag with which my father went to defend the Radio House, and which we have here at home to this day is truly cornflower blue. When I graduated from University in 1988 we all had our caps on during the graduation ceremony, with a light blue base colour and with the red band covered by a black ribbon. The Biology and Geology Faculty of the University of Tartu was the first faculty to hoist blue-black-white flags on the University main building again for the graduation ceremony: adorned with beautiful cornflower blue flags. It happens with cornflowers in a vase, or on drying, the colour soon fades, even to white. And so it happens with our national flag. Yet we kept its colour in our hearts and searched for ways to preserve them. People in Kullamaa were skilled in preparing dark blue from cornflowers, but also those in Setomaa and Rakvere. And Jaan Jakobson has recorded a long in-depth instruction from Vastseliina on how to produce a blue from cornflowers that will not be damaged by washing or by sun bleaching. There are surely many things that we still have to discover about our national flower. Maybe even this, when do cornflowers start flowering in our fields? When I asked my Facebook friends about it they believed that it must be around the Song Festival because everybody had cornflowers in their hands and on their heads. But those were mostly garden cornflowers. Splendid that Estonia has the e-Biodiversity database because there I found, after a tip from plant specialist Toomas Kukk, the earliest find – cornflowers picked by my study course friend Jana-Maria Habicht on June 17th. There it also turns out that cornflowers in Estonia flower mainly in July and go on until the end of September. To my surprise this week I found in the database of my own photos a photo of a flowering cornflower that I had made at Lake Võrtsjärv on June 15th. Coming from cranberry grower Toomas Jaadla, I simply could not drive on past this cornflower field without stopping and picking some flowers. So obviously the life of our national flower needs more precise and country-wide monitoring. There is another interesting fact that people who haven’t picked cornflowers in a field don’t know. A cornflower can actually grow more than a metre tall. Just above the head of a little child. At the tip of the cornflower stem there is never just one “flower” – or rather, a beautiful blue inflorescence; there are at least half a hundred of them spread out. All in different stages of flowering – some already white from age, some still in the cone-like bud, with only blue down at the tip. While many claim that cornflowers will grow in polluted fields, for me it is a symbol of purity and of pure ecological food. In fields sprayed with herbicides against dicotyledonous weeds it cannot grow. But this theme too would need separate research. Finding cornflower seeds among rye or wheat is complicated so it keeps stubbornly growing in the soil of our fields. To pick cornflowers you always have to bring along scissors or a knife, they cannot be broken off. Either it leaves the field altogether – with the root – or the flower that was to be picked stays, drooping. But the remaining flowers try the more persistently to set seed and create a new generation.